After the terrible R-51, if you're thinking, “Oh God, not another Remington pistol,” don't. Yes Remington has a bit of spotty history recently. They have had some quality issues with some of their long guns as Linoge at Walls of the City Blog can attest. Their single stack nine, the R-51 was a disaster. It had horrible quality control issues and had to be recalled despite great fanfare leading up to its release. So people may be a little wary of the idea of another small pistol being released by a Remington. I can tell you now, having gotten my hands on it, having fired it and having carried it that I like it. And I think you will too. The RM380 bears no small resemblance to the Rohrbaugh R9 and there's an interesting reason for that. 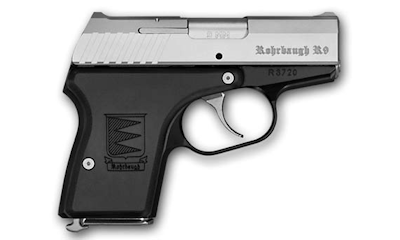 Remington apparently purchased Rohrbaugh, lock stock and barrel which bodes well for the future of this little pistol. Left to their own devices it's probably safe to say that the Remington RM380 would be a disaster without the influence of Rohrbaugh. The gun looks like the Rohrbaugh and feels like the Rohrbaugh, but Remington made some very interesting improvements that make the RM380 a better gun. I've never understood why anyone would pay the kind of money that the Rohrbaugh commands. I guess to have something that's handmade and handcrafted, that's great and I understand the desire to own something with that kind of craftsmanship. Like a Swiss watch or a Mateba revolver or a Lamborghini. But to put that that kind of money into a gun designed to ride around in your pants with pocket lint and gum wrappers doesn't make a lot of sense to me. It's like buying a bottle of Moet & Chandon Dom Perignon Reserve and then drinking it from a red Solo cup. Unlike most of your pocket .380 guns, the RM380 has an aluminum alloy frame with changeable plastic grips. I don't think at this point there any aftermarket trips available but at some point one can assume this gun is popular and successful there will be ways to personalize your gun. It’s a touch heavier as a result, but not much. The first thing right out of the box that impressed me was how easy it was to rack the slide. Most pocket .380s are notoriously difficult to rack the slide and there are two reasons for that. One is a very heavy recoil spring to handle the recoil impulse with a very small, polymer gun. The other reason is that most of those small 380s – the Ruger LCP or Diamondback DB380, or Kel-Tec P32 or P3AT — all have relatively small slides that don't give you a whole lot of grip surface. The RM380, on the other hand, seems to be a combination of both a larger slide and a lighter recoil spring. The combination results in a gun that’s easier to rack, easier to manipulate, without sacrificing much of the concealability. It’s also more comfortable to shoot. More on that in a moment. The aluminum alloy frame is sturdier than polymer, giving the RM380 a more substantial feel without sacrificing weight. The stainless steel slide and aluminum frame still only weigh in at a tad over 12 ounces. 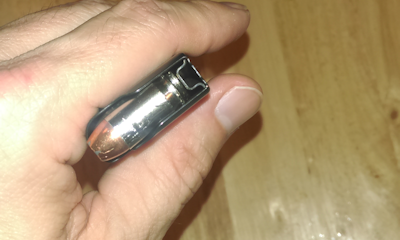 That more solid frame also soaks up the recoil of the .380 cartridge and makes the RM380 easier to shoot. The gun is also visibly more substantial. Other pocket guns are so small that you almost wouldn’t think anyone would take you seriously if you pointed it at them. The RM380 looks and feels more impressive and less like a toy, but it’s not so big or heavy that it can’t be carried comfortably in your pocket. I used the same Daltech Force and DeSantis pocket holsters with the RM380 that I had been using with the P3AT and DB380 previously and they worked perfectly. The RM380 fires from a locked breach using the Browning-style tilting, linkless barrel system. The magazines hold six rounds, but they are wider than most .380 magazines. It appears that these might be based on the Rohrbaugh magazines with a small spacer inside to make the .380 cartridge fit securely. Based on this, it’s been surmised that we might see a 9mm version in the future. The RM380 ships with two magazines: one with a flat baseplate and the other with a polymer finger extension. The longer baseplate does not add capacity however, it just gives you a better grip. The RM380 is 2 ounces lighter than the R9, but is almost identical in all other dimensions. Same barrel length (2.9 inches) but roughly a tenth of an inch larger in length, width, and height. Remington also replaced the Rohrbaugh’s European-style heel magazine release with nice triangular, ambidextrous magazine release buttons in the American style. We’re talking about a defensive gun that is designed to save your life, not a $1000 status symbol. The last thing you need is to be fiddling with a magazine catch on the heel of the gun when you’re in a fight. The RM380 releases are perfect. I never had any issues hitting the release when I wanted to and I never hit them when I didn’t. The ambidextrous release buttons makes the RM380 perfect for lefties, too. Because of the size of the grip and the polymer frame, getting magazines to drop free can be an issue with small pocket guns. The short grips require you to adjust your fingers so the mag can drop out or the way the polymer frame flexes can cause friction and prevent a smooth release. The RM380 suffers none of these issues. The alloy frame, the larger grip, and the very positive magazine release buttons result in a smooth, clean magazine drop every time. The other thing that is nice about the RM380 that many other pocket guns don’t have is a functional slide lock and last-round hold-open. It seems this is something designers of these tiny pistols either cannot accomplish in a cost-effective way or because of the typical polymer-frame designs. The Ruger LCP has a slide lock, but this does not hold the slide open when the magazine is empty. The RM380 has a fully functional slide lock where you would expect it, on the left side of the frame. It’s recessed, making it impossible to activate accidentally and a little difficult to use to drop the slide with your thumb when you reload. It can be done with practice and it requires some concentration to hit it just right – something you may not have in the frenzy of a gunfight. So, it’s probably best to stick to sling-shotting or power-stroking the slide instead. The sights are your standard fare for a small pocket gun. A raised blade milled into the the front of the slide and a notch in the back, similar to other guns like the LCP. The RM380 is designed for close-quarters work, not long-range shooting, and for that the sights are adequate. Though I may take some paint and add a little contrast to the front sight post. Still, I found the RM380 to be acceptably accurate at close combat distances. The RM380 is a hammer-fired, double-action-only pistol with a recessed hammer. 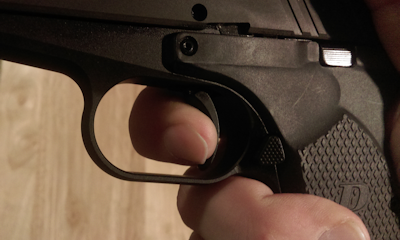 Unlike the DB380, LCP, or Kel-Tec, every trigger-pull actuates the hammer. The trigger pull is long and breaks at the back of the trigger-well. Remington says It’s an 8-9 pound trigger but I found most of that weight at the very end. It’s long, light and smooth most of the way and then it stacks at the end before it breaks. It requires more finger on the trigger and takes some getting used to. You can easily prep the trigger because of the long pull and the way it stacks at the end, but the break is predictable. You have a lot of smooth pre-travel, then you hit a wall and a stiff break. 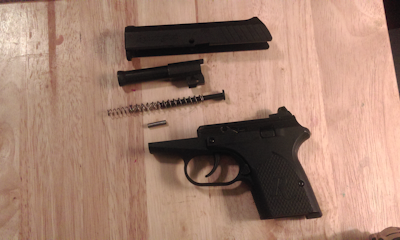 The reset is all the way back to the beginning of the pull, similar to a revolver or the SCCY CPX-2. Takedown is unusual. There are no external takedown pins or levers. There is a round cut-out on the left side of the slide and smaller one on the opposite side. You retract the slide to line up the hole with a pin in the frame, turn the gun on it’s side and shake. If you have the holes aligned correctly, a smooth roll pin will fall out. You may have to take a punch or a paper clip to push it all the way. Once that pin is out, you can remove the slide from the frame and the gun can be disassembled like just about every other gun you’ve seen. The guide-rod is steel with two recoil springs, which is why recoil is so mild and racking the slide is so easy to rack. The stainless steel barrel is the standard Browning linkless design which has been belled at the muzzle to improve lock-up with the slide. The slide rails are larger than usual. They are longer and thicker, improving lockup and fit to frame. The takedown pin is held in place by spring tension. Some have worried that it might fall out during firing but it’s not physically possible. It takes some real effort to shake or push the pin out so the millionth of a second during recoil that the hole in the slide is perfectly aligned with the hole in the frame is not enough time for the pin to fall out. Be sure not to lose the pin, though. It’s a fairly non-descript little pin and if you lose track of it you won’t be able to put the gun back together. You might want to order a few extras if you have a habit of losing small parts. Putting the gun back together I found to be a bit of a chore and it's the biggest knock on the RM380. While the retaining pin can easily be punched out of the frame, pushing it back in without a tool is difficult. I had a hard time finding the best way to grip the gun to keep the holes aligned so I could get the pin back in. And once I did get it back in, it would not go in without a tap from a rubber mallet. Shooting the RM380 was actually fun. 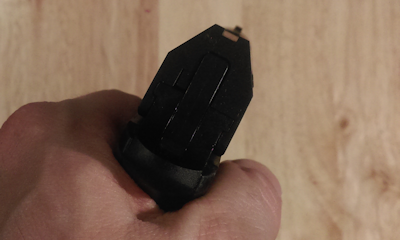 After range time with the LCP, P3AT, or DB380 my hand and trigger finger felt beaten up after about 50 rounds. Not so with the RM380. I shot several hundred rounds on my first range trip. My trigger finger was a little sore afterward, due I think to the longer trigger pull but compared to the other three it was a joy. Loading the first round out of a magazine has always been an issue for me with other small pocket guns like the LCP and DB380. The first round often won’t chamber properly, usually because the recoil spring makes racking the slide to load the first round such a chore. I never experienced this problem with the RM380. It fed reliably every time. Again, I attribute that to the fact that it’s easier to retract the slide. Accuracy was acceptable at combat distances, especially once I got used to the trigger. Reliability was excellent. I had no issues with feeding or ejecting at all. I had one failure to fire, due to a hard primer, but because of the DAO trigger I was able to pull the trigger again and fire the round on the second try. Ball ammo and different kinds of hollow points ran great. For my first test I ran the RM380 straight out of the box, no cleaning, no lube and I never experienced a single malfunction in over 200 rounds of target and self-defense ammo. Overall, I am really impressed with the Remington RM380. I think they have a winner here. 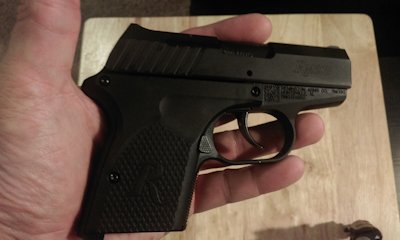 It’s my new pocket gun and hopefully it’s a sign of good things to come for Remington handguns. Never failed to fire, eject or feed. Reassembly of the RM380 after cleaning is frustrating. Ambidextrous mag release? Functional slide lock? 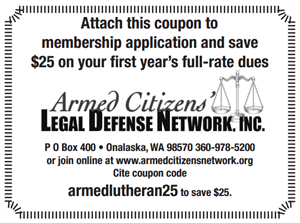 Undercut trigger guard? Check, check, and check! Smooth, long DOA trigger takes some getting used to but improves the more you shoot. It looks like a Rohrbaugh without the snooty pricetag. 1 Comment on "Remington RM380 Review"
I find this little rm 380 to forfill my needs perfectly.No jams no failuars at all. Lite easy to carry. Trigger so much better than Kel tec. Great little gun I like it alot.